I have tried your example too and it works in simulation, but when I tried in reality with a real PIC and MCP4725, then it does not work. 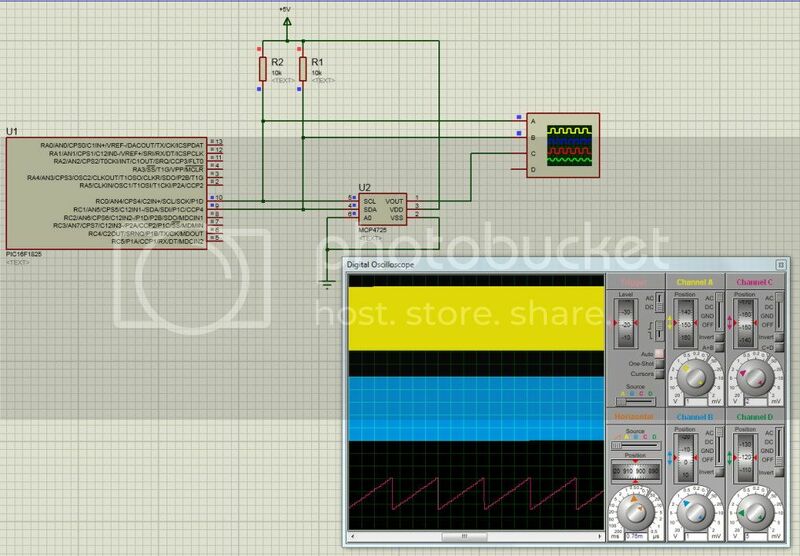 I can see the I2C signals, even decode them with the oscilloscope and the problem is with Acknowledge. Besides that on simulation and as well on real oscilloscope there is a strange pulse on SCL signal. Did someone succeed with a real PIC and a real MCP4725? the #use i2c() statement and see if it starts working. If you want to run at 400 KHz, then change the pullups to 2.2K. board as the PIC, 2.2K should work. I will try that tomorrow. Actually, today I have installed 1K pull up resistors and I have tried 400KHz and also 100KHz. 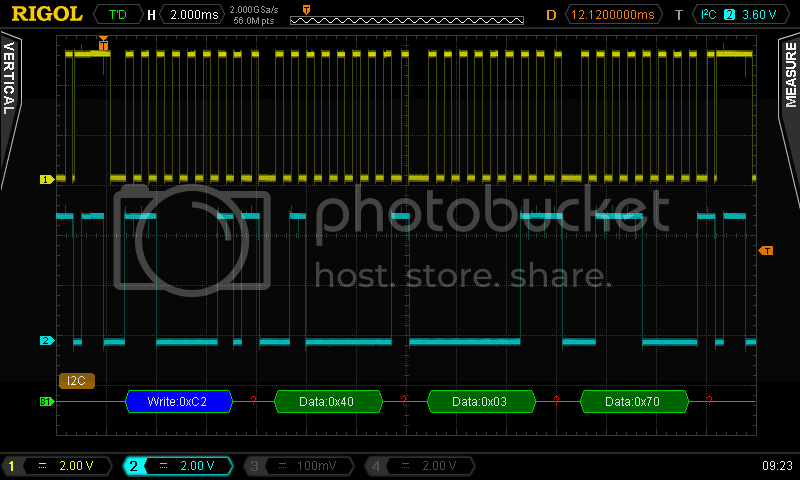 If it is of any help, I can post tomorrow screenshots from oscilloscope with I2C decoding. rising edge, while 2.2K or 1.5K is much better. I will try today 2.2K and 1.6K and 4.7K. 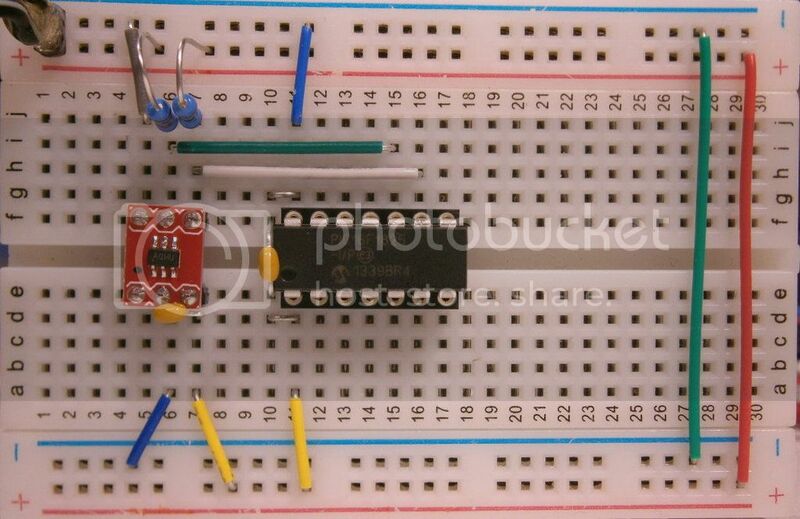 The PICtail board has 10K pull up resistors, page 32. The SOT-23-6 Evaluation board has 5K resistors, page 26. 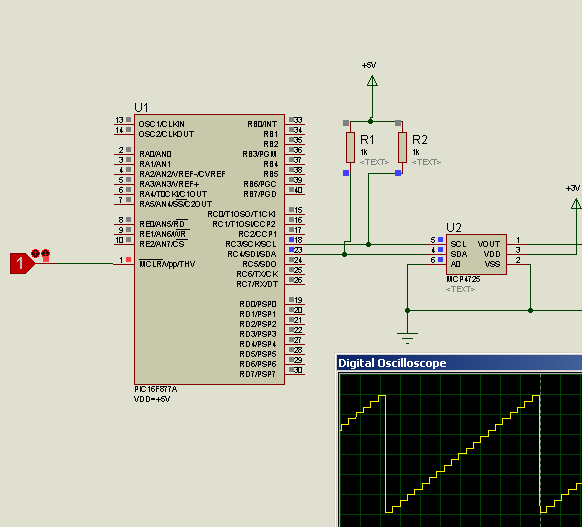 The PICtail board shows also the proper waveforms for I2C, page 16-17. First of all I made some photos with the test breadboard that I use and that was the moment when I have seen the code on the MCP4725 and I double checked with its datasheet and surprise, the address on I2C is not A0, but A2, because the code is AQHU on the chip. 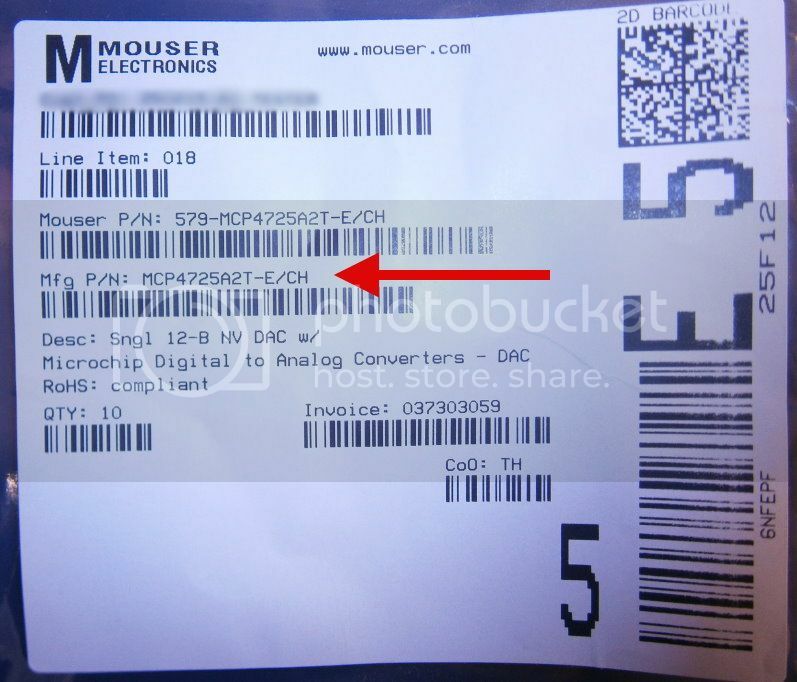 Then I searched for the shipping bag from Mouser and was confirmed A2. Then I installed 2.2K pull up resistors and I removed the “FAST=400000” from #use line, as you suggested. 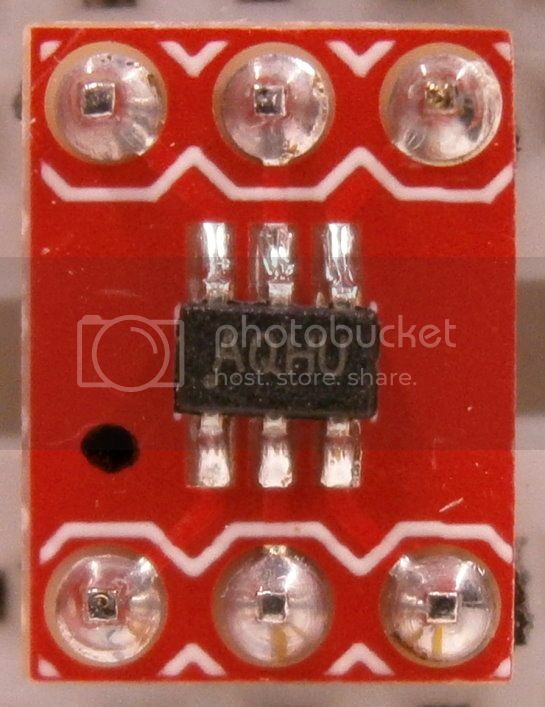 The MCP4725 still does not respond, the output voltage is a DC line 2.6-2.7V. Because I have 10 such DACs, I tried with the 2nd one and the result was the same. 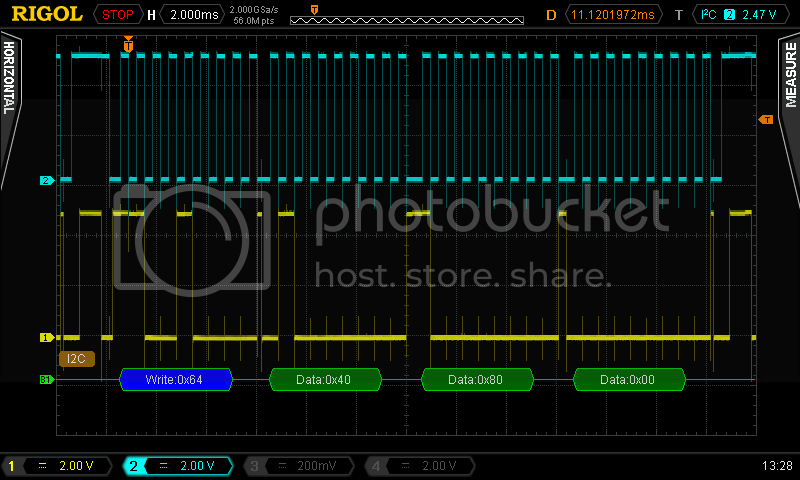 Then I watched the I2C signals and in the screenshots below, directly from real oscilloscope. The waveforms on SDA do not look as in Microchip PICtail board pdf page 16-17. The problem seems related with Acknowledge bit. The error came from the address, which was confusing to be set. I will come back Monday with explanations, details and oscilloscope screenshots. The error came from the address. 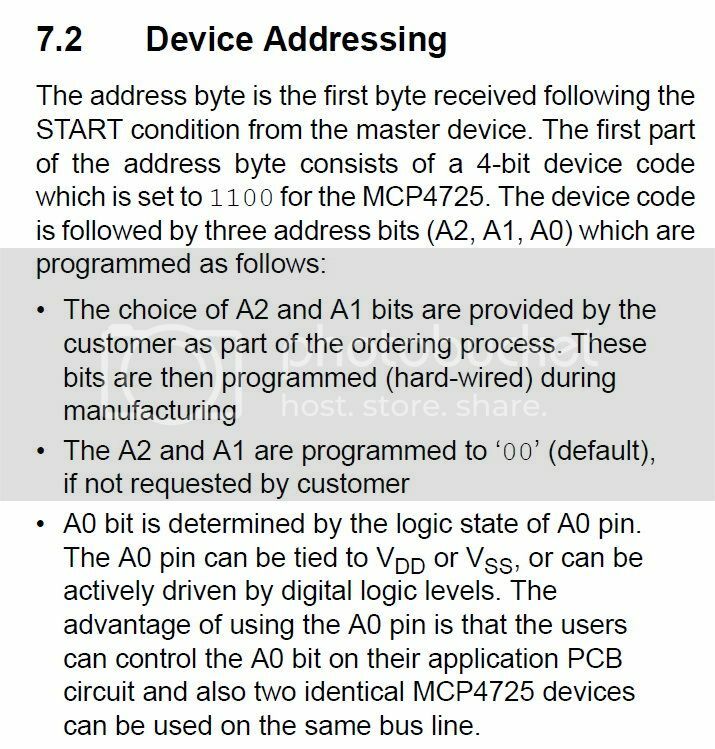 The address on I2C is not A0, but A2. program. It would have found the slave address quickly. Here are few explanations which may be useful for other users in future. And I did not ask for any special address, so I asummed (wrong) that A2 and A1 is 00. The code marking confirms the ordering code. In my case A2 and A1 is 10, code marking starting with AQ. 2) When you look at the C code above any you check the device addressing how is it formed with A2, A1, A0, do not make the confusion/mistake with Address Option Part Number at Package Marking Information. There we have too A3, A2, A1, A0, but these have nothing to do with A2, A1, A0 used to form the I2C address. For me it created a small confusion. It would have been good if Microchip would use other names for Address Option Part Number at Package Marking Information. 3) When you write the C code you need the steps above. You initialize once in the beginning the I2C. 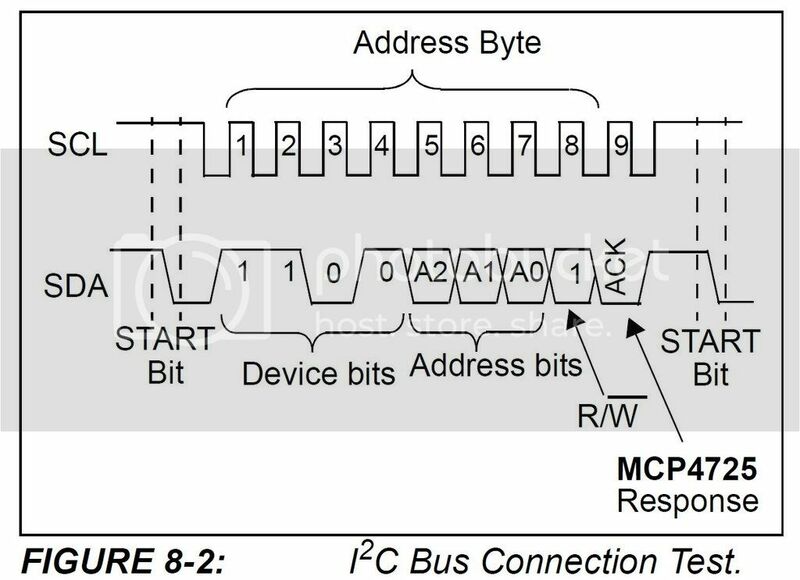 Then each time when you send data from PIC to MCP4725 there are 6 steps in our case: START, SEND Device Address, SEND Internal Device Address, SEND DATA, SEND DATA, STOP. 4) The biggest nightmare that you might have is SEND Device Address if you do not know exactly what your address is. Probably using an I2C scanner would be easy as suggested. We start with 1100 for Device Code, then follows A2, A1, A0. In my case A2 and A1 is 10. A0 depends where is connected, to VSS it is 0 and to VDD is 1. In my case I connect to VSS(-) and I have the A0=0. Then I have Slave Address 1100 10 0. Here are 7bits. Because is a write operation, the last bit will be 0, which will be added after Slave Address to form the Address Byte. Then I got the Address Byte 11001000. This is what I will use in SEND Device Address. 5) Then follows SEND Internal Device Address. 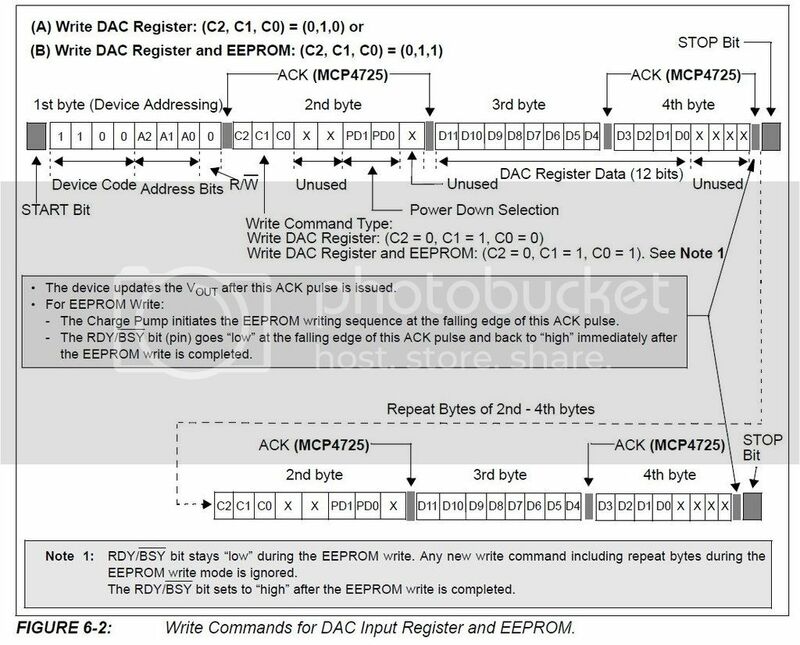 Write DAC Register: (C2, C1, C0) = (0,1,0). Here we have C2 C1 C0 X X PD1 PD0 X, where X is unused, so we can consider 0. PD1 and PD0 bits are power down bits, which for normal operation are also 0. Only when we want to put MCP4725 in Sleep mode, low power consumption, then we modify these bits. Then for normal operation, writing only to DAC register we have 010 00 00 0. This is what we send with SEND Internal Device Address. 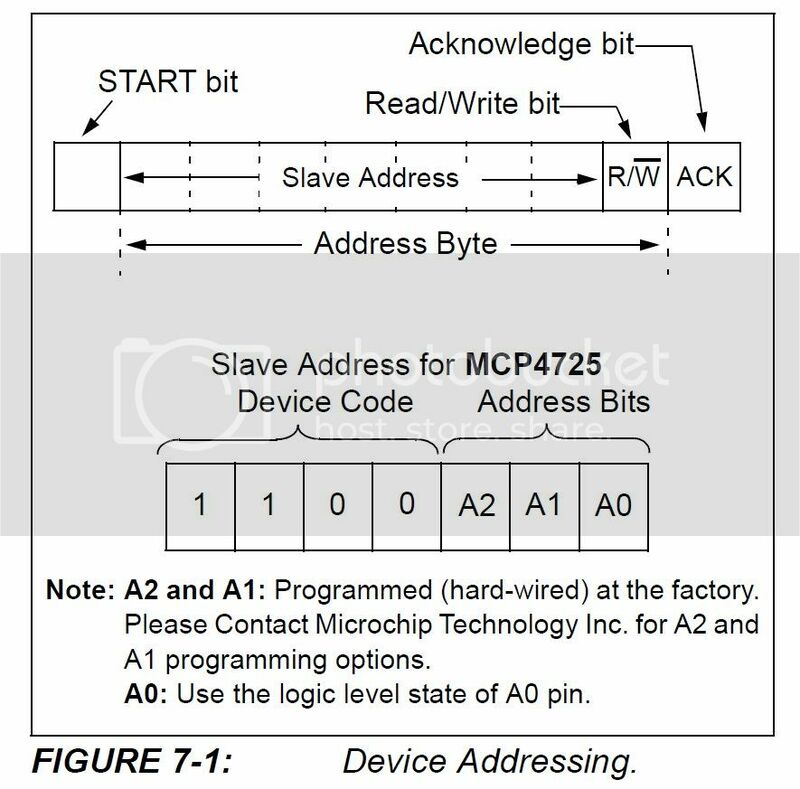 6) The rest is data, sent in 2 lines, because the MCP4725 is 12bits, so we must split these 12 bits in 2, because we send 1byte (8bits) each time. 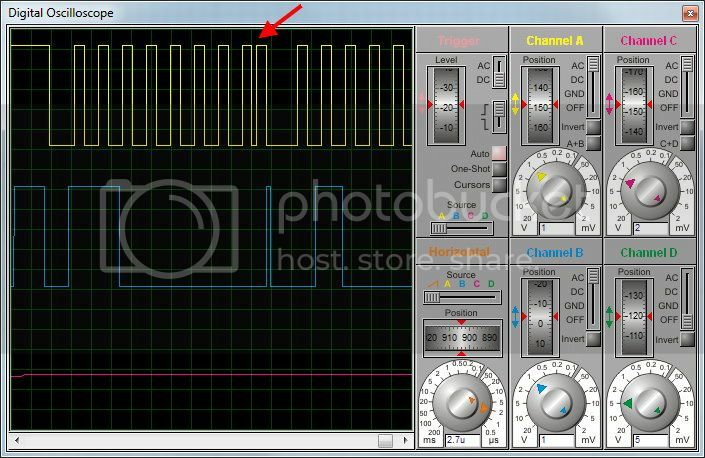 7) Below are the oscilloscope of a real working device, I2C signals and Output voltage. At #use I2C parameters I tried without “FAST=400000” and then is the same as “FAST=100000”. Then I increased step by step the frequency and in my case worked up to 1.9MHz. I have tested also “FORCE_SW” instead of “FORCE_HW” and takes a bit longer when I2C is emulated software, as expected, but is a very good option when the PIC does not have hardware I2C. I would like to generate a rectified sinewave 1Vpp 100Hz using MCP4725 and lookup table. The PIC is the same as above, PIC16F1825 working at 32MHz. - Either I introduce some delays as “nop” above. I have tried with “delay_us();” but is not so precise. - Or I play with I2C bus speed. In this case I set it to 600kHz. - Both above, as I did it. My problem is that I would like to emulate the sinewave as good as possible. That would imply more points in the lookup table. I have tried with 300 points and the I2C and the PIC is too slow. 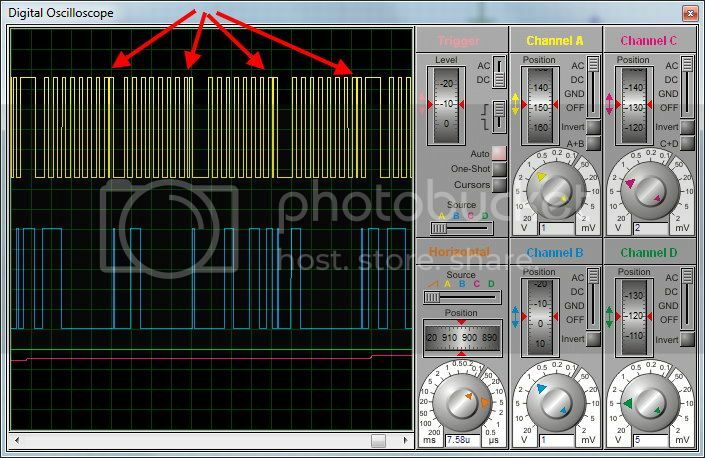 Another idea would be to use instead of 5Vdc for PIC+DAC another voltage as 3Vdc for example. The 1LSB of the DAC would be instead of 5V/4096 only 3V/4096 and I could get higher precision on Y axis, on amplitude. But that would not change my limitation on X axis, which is limited by the PIC code execution and I2C speed. Do you have any thoughts on this, except using an SPI DAC that has higher speed than I2C DAC? 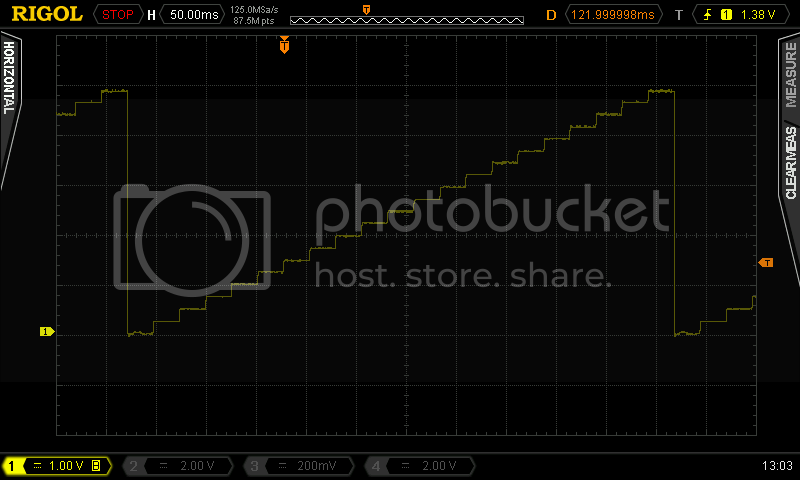 What about a simple PWM sinewave generator with lookup table (only the PIC PWM+ filter, without any DAC)? Would that generate a better sinewave, knowing that PWM has usually only 10bit resolution?